Whatever else you can say about it, The American Dream has interesting edges, often more so than the middle. I had the good fortune of growing up near and in a wonderful edge in Akron Ohio—the Cuyahoga River Valley. My friends and I could be in what we considered very wild country a short walk from the back door. The river was famous for occasionally catching on fire from petroleum pollution, but between fires we learned to swim and build rafts in that river. We drew maps of the Indian mounds along the shore as we floated toward Cleveland. We met reclusive eccentrics living in tipping house trailers. We learned how to be in a very chaotic and sometimes dangerous environment. Above all of this adventure were housing developments, inhabited by parents, taxpayers, landowners, and lawn mowers-the superficially tidy dream. Johnson’s photographs map the edges of newly created Edenic neighborhoods built on recently bulldozed land. Eirik Johnson’s Borderlands project brings back detailed memories of my time in northern Ohio, but also presents similar terrain through newer eyes in a much different time. We sensed encroachment on our beloved wild territory-today it is assumed. Most people don’t see the margins where this is occurring. Johnson’s photographs map the edges of newly created Edenic neighborhoods built on recently bulldozed land. The contractors have left little piles of the detritus of their work just out of sight. An occasional trail indicates that a newer generation of children are exploring here. There is evidence of squatters-clothing hanging in the trees, spent camp fires. As in Eugene Atget’s best photographs, there is an uneasy possibility that something mysterious has happened or is about to happen. The silence of the photographs replicates those quiet punctuations in nature like the moment in William Faulkner’s story, The Bear, when the birds stop singing and young Isaac McCaslin knows the bear is watching him. This anticipation is in tension with a strange, relaxed beauty-scraps of discarded human detritus animate the spaces in ways that nature cannot. Nature isn’t just giant trees and leaping crystalline rivers. Nature is in the cracks in the sidewalk-it is the whole system, including the mind that decided to build the sidewalk. Some of the ideas behind this work are in the tradition of Robert Adams who pointed out in the 1970s that nature isn’t confined to officially designated wild places. The National Parks are deceptively small anomalies surrounded by clear cuts and dammed rivers. In the early 1980s an anonymous clever person put an official looking sign up along the highway leading east out of Vancouver, British Columbia, Canada that read “Entering the Environment.” This is precisely Adams’s and Johnson’s point expressed cryptically. Nature isn’t just giant trees and leaping crystalline rivers. Nature is in the cracks in the sidewalk-it is the whole system, including the mind that decided to build the sidewalk. 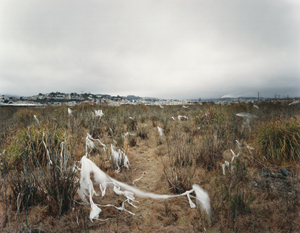 Johnson’s borderland places make a certain kind of residual freedom visible. This work is also in the tradition of the Geological Survey photographers of the last half of the 19th century-William H. Jackson, Timothy O’Sullivan, John K. Hillers. Like the strange empty mammoth plate images of those photographers, we can only engage Johnson’s pictures conceptually, or even formally, when we start to wonder why they were made. The older images were made to indicate vast areas open for development, mining and farming. Johnson’s images are of what is left after that progress. But there is another connection to the 19th century images. When the earlier photographs, and paintings by Karl Bodmer, Albert Bierstadt, Thomas Cole, etc., were seen back in civilization they made the abstract notion of the Frontier visible. 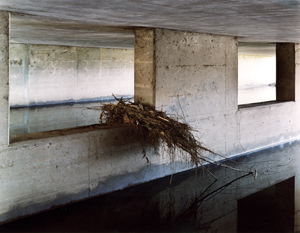 Johnson’s borderland places make a certain kind of residual freedom visible. Similar to the possibility of self-reinvention that the Frontier offered, these scrappy places allow us outside the rectilinear fences of our regular lives if we choose to let them. Perhaps because of my own experiences, I also find an emotional content to Johnson’s images generated by memories of being temporarily off the tether, and the self-reliance that freedom both inspires and requires. The confidence to move ahead, reading the evidence of friends and strangers passing before, seeing what has changed and what hasn’t, and why, since the last visit-these are all tools that we later put to different use. The Eirik Johnson: Borderlands exhibitions, presentations, and related programs are sponsored in part by the Illinois Arts Council, a state agency; City of Chicago Department of Cultural Affairs/After School Matters; American Airlines, the official airlines of the Museum of Contemporary Photography, and our members. The Eirik Johnson Borderlands puplication has been generoulsy sponsored by the Elizabeth F. Cheney Foundation. 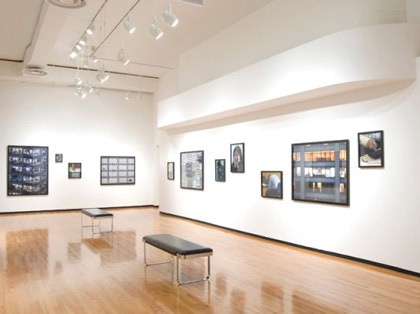 Photographs are courtesy of the artist, Yossi Milo Gallery, NY and Rena Bransten Gallery, San Francisco.